A furious neighbour slapped police with a note threatening to clamp a marked car while they were attending the burglary of a 94-year-old victim. Officers rushed to a house in Shirley in the West Midlands and parked on a residential street to arrest a thief on Sunday. But when the force returned to their marked Vauxhall Insignia, they were shocked to discover an angry resident had left a menacing note on the windscreen for parking in a private bay. 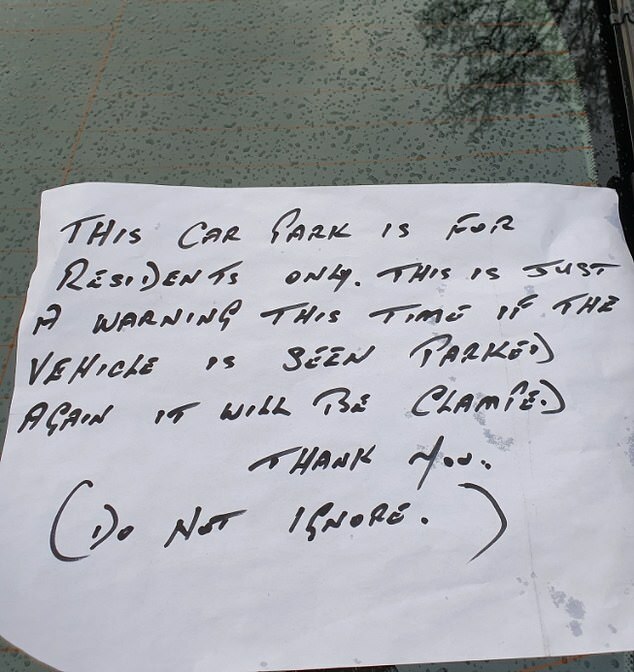 The note read: 'This car park is for residents only. 'This is just a warning this time if the vehicle is seen parked again it will be clamped. West Midlands police blasted the note claiming they parked 'professionally and considerately' while they were fighting a crime. Officers took to Twitter to express their disappointment that 'not all members of the public appreciate the good work they do'. West Midlands Force Response wrote: #Solihull #BUnit attended reports or a distraction Burglary in Progress in Shirley. As officers arrived the offender opened the door of the address and was swiftly arrested. Officers added that they often have to park cars to quickly attend crimes and choose spaces 'for a reason'. Member of the public have now been outlawed from clamping vehicles on private land under new legislation that came into force in 2015. The Protection of Freedoms Act makes it a criminal offence to clamp vehicles on private property to protect motorists from rogue companies and the public. And those motorists whose vehicles are illegally clamped on private land can now call the police.